Earlier this month, we put the finishing touches on our new website — one that will take us into 2015 and beyond, elevating our vigorous efforts to educate architects, engineers, and the larger public about the destruction of all three World Trade Center skyscrapers on 9/11. 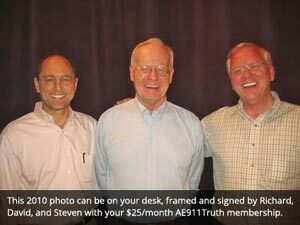 Today, with the launch of our 2015 Membership Drive, I invite you to visit the new website — and, if you haven’t already, please become a sustaining member of AE911Truth for as little as $2.50 per month. During last year’s annual membership drive, we welcomed over 1,000 new members into the AE911Truth family, allowing the organization to grow and professionalize significantly. Our goal for this membership drive is to equal that number because we must accomplish even more in 2015. It starts today with our spectacular new website, and with you! Each level of monthly giving comes with a special gift as a token of our appreciation for your generosity and commitment. This year we have two extra special gifts: By joining at or upgrading to $12 per month (just the cost of a sandwich and beverage! ), you will receive a copy of the acclaimed documentary The Anatomy of a Great Deception, the perfect video to share with friends and family who are on the fence about 9/11 Truth. And at the $25 per month level, you’ll receive, in addition to the documentary DVD, this gem of a framed photograph, signed by me and two renowned 9/11 researchers, Dr. David Ray Griffin and Dr. Steven Jones.